In the first part of the first ever BloggingPro End of Year Giveaway we have an interview with no one less than Thord D. Hedengren. Thord is most known for his WordPress designs and his time as Editor of The Blog Herald. Thord has been rather quiet in the international WordPress scene over the last months but now is ready to return to the front stage with his soon to be launched book Smashing WordPress: Beyond the Blog. We were lucky enough to interview Thord and are exclusively giving away a copy of his book for 3 of our readers! Thord, thanks for taking time for this interview. You have been rocking the WP design community for years with your very own signature style but recently you disappeared. What happened? It’s my pleasure. As to me disappearing from the scene, well, it’s a mix of work and personal life that switched my priorities. I’ve been doing a lot of writing the last year or so, the book as you well know, as well as doing freelance work for magazines like MacWorld. I’ve also worked with Swedish newspapers to roll out a local blog network, and projects like that. It has been nice to return to my own backyard so to speak, being Sweden of course, at least for a little change in work scenery. It was never a conscious decision to slide out of the WordPress community, and I’ll remedy that by giving the Notes Blog theme a boost early 2010. You are the next of a very elusive group to publish a WordPress book. What motivated you to write a book about WP and what can the reader expect from your book and when will it be released? My publisher, Wileys, approached me after having read my WordPress as a CMS post on Devlounge. They liked the basic concept, and since I’ve always felt that WordPress is a publishing tool foremost, and a blogging platform second, I found the prospect of writing a book where I could share my thoughts on this exciting. Luckily the good folks at Wileys liked my ideas, so things went pretty smooth from that. Smashing WordPress: Beyond the Blog will help anyone having played around a bit with HTML, PHP, or WordPress to build great sites. While it does indeed tell you how WordPress works and how you can build both kickass themes and plugins with it, the part I’m most excited about is the more conceptual one. There are a ton of things beyond the blogging that you can do with WordPress, and that is what I’m trying to convey in the book. WordPress is truly a great platform, and it gets even better when you understand all you can do with it. You can pick up the book on January 22nd in the US, and a few weeks later in the UK as well as the rest of Europe. One thing I always noticed about TDH was that TDH doesn’t really blog. Your brand is well-known but there is no such thing as a ‘TDH blog’. This seems against pretty much any rule of the game, how did you manage this? It’s madness, I know! I did roll out a blog when I decided to start writing in English, and that landed me the Blog Herald gig under Matt Craven. Since then, I’ve been freelancing a lot, editing the Blog Herald (up until recently), Devlounge, Wisdump, and more, as well as launched a bunch of blogs and sites myself. Those opportunities, along with a great deal of word of mouth, have certainly made this possible. But yeah, it is most certainly against every rule of the game not to blog. I haven’t had a serious portfolio either, and I’m almost ashamed to say that I’m not even struggling to make that happen either. Things seem to work out for me anyway. That being said, after leaving the Blog Herald I’ve decided that I should indeed blog for me for a while, so that’s why I’ve rolled out TDH.me. Facebook status updates, Twitter, Status.net and many more. It seems that we are living the era of ‘blogging on speed’ right now. Popular blogs have more and more become high paced magazines. What is the future of blogging according to you? That’s true, and I’m completely fine with it. Maybe now we can kill this weird idea of “blogging” that we all seem to be carrying around. Blogging is just another word for online publishing, with the difference that it is so easy that anyone can do that. Old media should be very, very, very afraid. The future of blogging per se is better blog publishing software, social media integrations and whatnot. That’s all completely uninteresting. What is interesting is that this will bring better content from people not tied to the old media outlets, it already is, and that is both changing and shaping the media landscape. Quality content. That’s the future of blogging, online media, and the only way to success in the long run. Content is king. bbPress will receive Matt’s exclusive attention over the next months. I am, and many more bloggers I know were, a former forum nut. Can we expect a return of the forums if Automattic and the community will focus on the forum plugin? Perhaps not a return of the forums, because when you and me and all our friends hung around and yapped about this and that, those old school bulletin boards where one of a mere few ways to communicate online. Today we’ve got social networks that make every forum from the 90s look bland. The need just isn’t the same anymore. That being said, there is a place for forums as well, as a part of big sites and for small groups of likeminded individuals to talk freely. In that sense a better bbPress could mean a return of the forums, but it’ll be just one more feature on the magazine-like blogs we spoke of earlier. And that’s fine too. WP continues to grow. Do you think there are any viable alternatives for the user? What are they and what makes them stand out as alternative? There are alternatives, and two spring to mind, none of them being Movable Type, I’m afraid. The one thing that keeps WordPress from being used as a CMS on larger sites in Sweden is Drupal. One might say that WordPress and Drupal are entirely different beasts, and that’s true, but at the same time they can fill the same purpose. This is changing as we speak, but Drupal is the viable alternative for the media user, if not the small time blogger hoping to make some Adsense dollars. The second alternative is Habari. Not that I’d say that Habari is a serious alternative or anything today, although I’m sure it is great, but because of what it stands for. WordPress is getting bigger and bigger, and some say it is in dire need of a complete rewrite. Habari is new and fresh and doesn’t have to cope with the old deadweight. I think we’ll see lightweight alternatives gain some ground, just because they are lightweight and WordPress is not. Your book will also be released with Smashing Magazine, how was it to work with Sven & Vitaly. I haven’t had anything to do with them directly yet, they are not involved in the book itself, but rather deal with the publisher on a book series sort of level. All in all, everything I’ve heard is that they are great to work with, so hopefully I’ll get the chance to do that in the near future, as the book nears the counters and whatnot. Thanks for taking time for this BP interview, Thord. We wish you a successful book launch and a great 2010. Thanks for having me! Always a pleasure. How To Enter The 2009 BloggingPro End of Year Giveaway? Until the end of 2009 BloggingPro will host every day a new giveaway and every day a new price can be won. Winners will be randomly chosen and announced here on January 3rd 2010. The book Smashing WordPress: Beyond the Blog will only be released in the second half of January 2010. Winners will be send their copy as soon as the book is released. 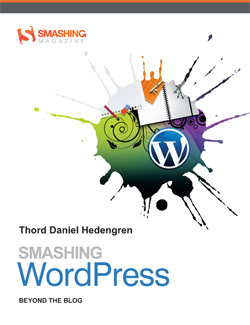 To participate to today’s competition and win one of three Smashing WordPress: Beyond the Blog books by Thord D. Hedengren, follow follow BloggingPro on Twitter (we will check) and leave a comment with your Twitter ID below or follow us and tweet about the BloggingPro giveaway. Today’s competition will be closed on December 28th 2009 at 23:59PST. I am looking forward to the release of this book. I hope I win the awesome book! This looks like a very interesting book! I would love to win it! Just followed @blpro. The title of the book and the front cover looks so amazing, I’d love to own this book and update my wp knowledge. Sounds like Smashing WordPress is an ace book on WordPress. I’d been following Thord D. Hedengren before over on The Blog Herald, and I was into his Notes Blog Core WordPress Theme, we spoke about it a bit on Twitter and I’d wondered where he’d gone, good to see he is back though! 😉 Thought it was a good interview too Franky, looking forward to the others in the days to come! Thanks, Mark. I use Notes Blog Core on my site and have also used it as base for several designs for clients. This interview was fantastic – it was nice to hear the thought process behind such an infamous WP guru. I’m new to WordPress and just discovering all the cool things it has to offer. But I caan’t wait for this book to be released, because I’m sure it will be a good next step for me! Thank you, Sara. Nice to read that you enjoyed the interview. I want. I want a lot. Hi! My knowledge of WordPress is mid-level, and I would love to learn more about it. I have a particular interest in WordPress designing. Just had time to read the interview, you ask great questions! It’s strange that Hedengren doesn’t have an official portfolio. I guess he runs off of “name” alone. Ahh, to have that status! I hope this doesn’t count as a double entry. I replied under my own name and didn’t add my Twitter info this time. Thank you, Danielle. I must admit that I know Thord since several years and that certainly makes an interview easier. Very good interview, looks like a great book as well. This is a really great interview of Thord D. Hedengren. I like his outlook on the future of blogging and that he sees it as Online Publishing, not just blogging. Looking forward to the New Book Release. Interesting thing is that I just pre-ordered my Book, but would love to win one to share.